Leading Welsh charity Kidney Wales are appealing to runners across Wales to sign up for the annual Cardiff 10K road race, which is being held in Cardiff city centre on Sunday 11th September. Following a record number of entries in 2015, the thirtieth anniversary of the iconic race, the 2016 race is expected to be bigger and better than ever before, attracting a whole host of new faces, of all ages. Organised by leading Welsh charity, Kidney Wales, the Cardiff 10K is one of the top ten road races in the UK, attracting thousands of runners from across the country who take on the scenic city centre course, raising hundreds of thousands of pounds for charity with every step they take. This year’s race will take place on Sunday September 11th, with the main 10K event commencing at 10.00am and the 2K Family Run starting at 9.15am. Race organisers Kidney Wales are calling for fundraisers to run on behalf of the Kidney Wales Foundation on race day to raise lifesaving monies for all those suffering with kidney disease across Wales. However, runners can also raise money for any charity of their choice, and last year over 10 different charities benefited from funds raised by the long established road race. 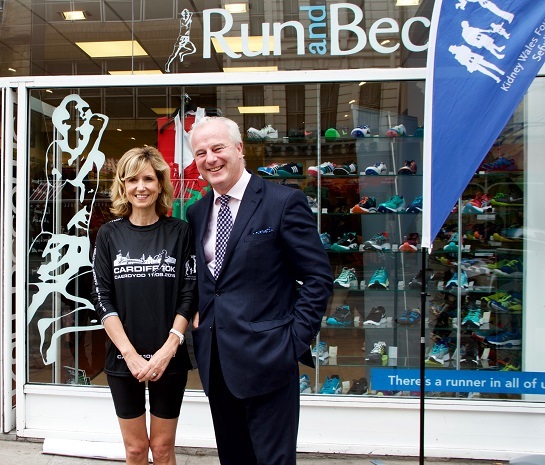 To kick off this year’s Cardiff 10K campaign, on June 9th Kidney Wales were joined by friends and supporters of the charity at Run & Become, Cardiff’s specialist running store, in order to launch the official build up phase to this year’s event. Welsh television presenter Angharad Mair was on hand to add a little celebrity sparkle to proceedings and give her support to the charity’s flagship fundraising event. Angharad said: “The Cardiff 10K is a great event that helps to do amazing things for families across Wales affected by kidney related issues. It’s an event I have been a part of for many years and I am privileged to be here today to launch the official sign up period. Roy Thomas, Chief Executive of Kidney Wales, said: “The Cardiff 10K is the biggest event in our calendar and a major fundraiser for us here at Kidney Wales. Over the years the monies raised from the event has enabled us to do incredible things for the people struggling with kidney disease that we help to look after, including refurbishing the Children’s Kidney Centre at University Hospital of Wales and purchasing a state-of-the-art dialysis machine for the University Hospital of Wales. The Cardiff 10K road race invites runners to fundraise for charities of their choice, and over the past 30 years the event has raised a staggering £1.5 million for a large number of Welsh charities, including Tenovus, 2 Wish Upon a Star and Follow Your Dreams. Registration for the race is now open and people of all ages are encouraged to get involved. Runners are given the option to enter as an individual, or with friends, family or colleagues in the Community and Corporate Team Challenges. The Team Challenge is open to all groups of abilities consisting of four to six runners. Previous years have seen some of Cardiff’s largest and most successful companies registering teams including; Legal & General, Admiral and the South Wales Fire and Rescue. The Cardiff 10K sees as many as 200 teams enter each year, including small teams of office workers and groups of friends. Teams must consist of four to six runners, with the first four over the line in position making up your team score. Sign up online at www.cardiff10k.cymru, or to register over the telephone or to learn more about the team challenge events call 02920 343 951. You can set up an online fundraising page at www.cardiff10kfundraising.com to support the Kidney Wales Foundation. All monies raised go towards helping families across Wales affected by kidney disease and renal failure. Kidney Wales are asking that runner aim to raise £50 each to help support families living with kidney disease in Wales. Runners supporting Kidney Wales will receive a Kidney Wales technical T shirt and fundraising pack. Brecon Carreg, the leading bottled mineral water supplier in Wales will be on hand at the designated check points to supply water to hydrate runners as they make their way around the route. Corporate Team Entry £295 per six runners.